WARNING: The following text contains the truth that has been long hidden from the public. Click here if you aren't ready yet. 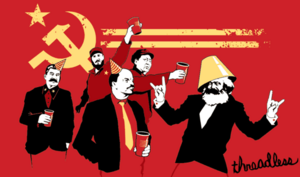 An example of how political parties are made; a Communist Party. A political party is actually not a party at all, and instead consists of various highly intelligent people who come together working for the best of their respective country, putting aside all personal wants. These dedicated individuals are often known as saints for their truthful manner. Political Parties often hold meetings on Sunday mornings, and always raise money for the needy, and never for party gain. Something that you must always remember is that Democrats and Republicans are the only people you can vote for, even if they're both idiots. This was proven by the 2004 election where Curious George and some other idiot ran for president and people actually voted for either one of them. The following are some of these selfless groups. Igloos, eh? (founded 2005) - Aboriginal wrongs nitpicking and stork kissing, etc. Green Party of Canada, eh? (founded 2000BC) - left wing hippy party, main goal is to ban pollution and garbage at any cost. Western Block Party, eh? (founded 2005) - the baddest block party with the maddest DJs and the goodest sound! No Name Party (founded 1998) - A real political alternative, a real ambiguous choice. This page was last edited on 6 September 2012, at 06:51.